[105.] If one chalice is not sufficient for Communion to be distributed under both kinds to the Priest concelebrants or Christ’s faithful, there is no reason why the Priest celebrant should not use several chalices.[Cf. GIRM 207 and 285a]For it is to be remembered that all Priests in celebrating Holy Mass are bound to receive Communion under both kinds. It is praiseworthy, by reason of the sign value, to use a main chalice of larger dimensions, together with smaller chalices. This is the source of the modification that wine be poured into different vessels before consecration. It rather overlooks the possibility that individual altar bread and perhaps even crumbs might be spilled. My sense is that the CDWDS largely lacked experience with this form of Communion and declined to consult people who did. Great care is needed for good liturgy, and for reverent handling of the elements, before and after consecration. These matter are better communicated with positive examples, rather than less mindful shalt-not’s. This entry was posted in Redemptionis Sacramentum. Bookmark the permalink. 1. 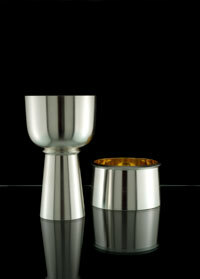 The opening clause (“If one chalice is not sufficient for Communion to be distributed under both kinds to the Priest concelebrants or Christ’s faithful”) implies that there is some value to a single cup (akin to the value of breaking a single loaf), though the threshold for overcoming that value is low (also similar to the single loaf). This should be particularly achievable in weekday Masses. 2. “It is praiseworthy, by reason of the sign value, to use a main chalice of larger dimensions, together with smaller chalices.” I know there are places that resist this idea. The clause doesn’t refer to elaborateness, but to size; akin to the idea of a larger host for fractioning.